p2 Divine and Lovely are one of the few light shades in my nail polish collection. And I really mean few. 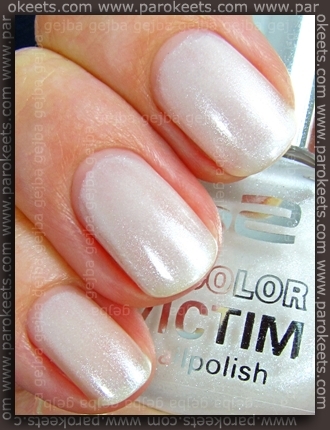 Divine is very pretty (dirty) white shade with gorgeous shimmer that sparkles like little diamonds. But I just could not capture all that sparkling on to the photo. Application was OK, but I used thicker layers because it’s quite sheer polish. Two layers with third one added to middle finger. I got p2 Lovely as a gift. This jelly light ping shade wouldn’t be too bad if not for the streaky application. I used three layers. Which shade do you like better? .-= Lyra´s last post … OPI- Summer Flutter Collection Summer 2010 =-. These are both gorgeous. I love the softness of Lovely. .-= Maestra´s last post … Too Faced haul and EOTD =-.